Water gardens and ponds come in all sizes and shapes. Some have fish while others contain only water plants. Every water garden is unique and has its own special features. Some are simple while others are very complex. There is nothing better than sitting by your pond with the beverage of your choice and relaxing. 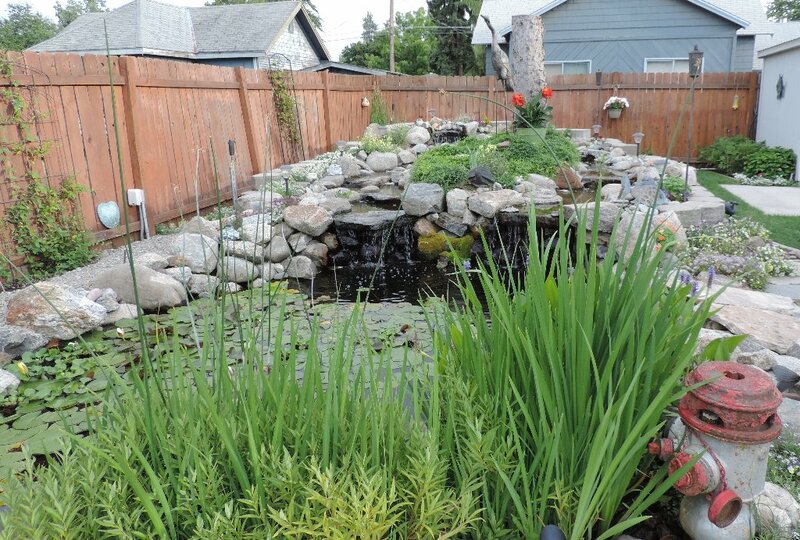 Click on the pond picture to the left to read about the ponds featured in our 2014 pond tour. Plants add a nice touch to water gardens and ponds. They add oxygen to the water as well as provide shelter for your fish. Many plants bloom and, therefore, provide beautiful flowers during the warm summer months. And some plants provide the perfect medium for spawning fish. Be careful what you put in your pond as some plants are invasive and might be forbidden in your area. To learn more about aquatic plants click on the picture of the red lily above. Knowledge is a wonderful thing and it's even better when it is shared. Technology certainly has made it easier for us to share information in new mediums such as online books, blogs, social media pages, tweets, twitters and on-line videos. For many of us, we still like and need face-to-face communications and interactions. Click on the IEWGKS logo to the left to learn more about water garden and fish clubs, books, blogs, and videos. Potting your aquatic plants and providing superior filtration. Building a Anoxic filtration system.